Hydrocarbons-steam Catalyst is used in CO2 -natural gas reforming and usually suitable for atmospheric pressure up to 5.0MPa, taking nickel as activity material. Hydrocarbons-Steam Reforming Catalyst is one kind of catalyst taking the nickel as its active component, the aluminum oxide for the carrier, mainly used in the methane hydrocarbon gas primarily for raw material (for example natural gas, oil gas and so on) a section of steam conversion system. It is usually suitable for atmospheric pressure up to 5.0MPa. 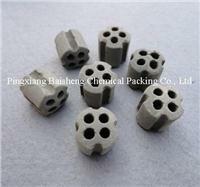 The product can be applied in the CO2 -natural gas reforming plants.